Shane Blaney has transferred to the League One side from Finn Harps. 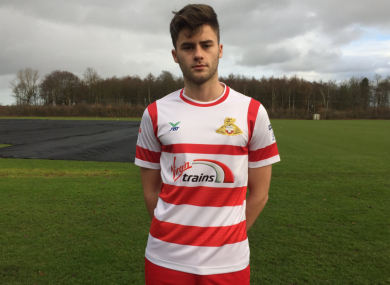 18-YEAR-OLD DONEGAL DEFENDER Shane Blaney has made the switch across the water to Doncaster Rovers from Finn Harps. The Letterkenny native was on the radar of the League One outfit for quite some time and yesterday, signed a two-and-a-half year contract with the club. Blaney, who turns 19 this Saturday, is typically a defender but can also play in midfield. He made his senior debut for Finn Harps in September after coming through the ranks there. He went on to make a handful of League of Ireland appearances. Blaney has also captained the Republic of Ireland Schoolboys side, and will now play under former Manchester United player Darren Ferguson — son of Alex — at Doncaster. “The aim is just to get as fit and strong as I can using the facilities here and put in the hard work. If I keep working hard I can eventually get into the first-team. Ferguson added: “I’m very happy that Shane is now joining us here at Doncaster. “We have been watching his progress at Finn Harps and have had him over here a couple of times. Shane wants to take his football career to the next stage so the coaching staff and management here are very much looking forward to helping him realize his ambitions with us at Doncaster Rovers. Blaney thanked the coaches at Harps as he made the move, with manager Ollie Horgan singing his praises and wishing him luck. Email “Signed, sealed, delivered! Donegal teenager makes the move to Doncaster”. Feedback on “Signed, sealed, delivered! Donegal teenager makes the move to Doncaster”.